Cyprus is a strange place with a fascinating history. Since before the Middle Ages it’s been at the crossroads of Christian and Muslim societies. Even today, an international border bisects this tiny island into the (Greek) Republic of Cyprus in the south and the Turkish Republic of North Cyprus. The south of the country has been a package tourist destination for decades and shows the scars of rampant tourism-fueled development along the coastline. The Troodos Mountains make up most of the beautiful and unspoiled center of the country. 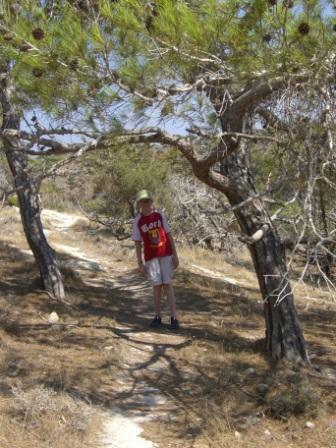 I loved the northern part of Cyprus which has escaped much of the over-development of the south. We were able to wander in small towns and take the boys hiking in the hills above Latchi (west of Polis on the map above) on the Aphrodite Trail. We didn’t particularly notice the wind that day, but looking at CAM’s stance in the photo above, almost exactly matching the angle of the trees, it’s easy to see why the landscape in this area is shaped by the wind blowing in off the Mediterranean Sea. Check out more photos in the Photo Friday series at Delicious Baby.